The library does most of the work. All you have to do is provide a list of the materials you need, and they assemble electronic copies. They even pay for copyright releases, if required! 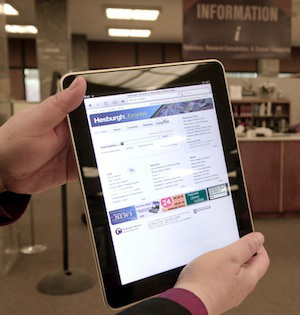 Some electronic copies are created by scanning paper documents, but many can be made available by linking to online databases to which the library subscribes. After your reserves are set up, students can access them on the library’s site or by using a Sakai tool called “Library Reserves”. Faculty members often augment electronic reserves with additional documents that they post in Sakai, Box or Google Drive. Image credit: iPad at the Hesburgh Library. Photo by Matt Cashore. Copyright University of Notre Dame.